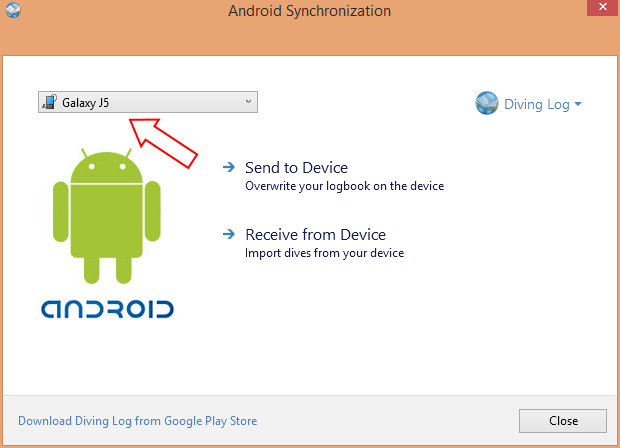 When trying to sync my logbook to my android phone from Diving Log 6 to Dive Log I am having some issues. I can not save the .txt file directly to the phone. When syncing to Dive Log, I select "SEND to DEVICE" and the "Save As" screen pops up, but my "phone" doesn't populate on the left side as an available drive or location to save to. I can find my phone as a location when I go into "File explorer". Any ideas on what can be done to correct the issue. To mitigate, I have figured out to save the dive.txt file to my desk top and then I open my phone via file explorer and then copy and paste the dive.txt file into the dive log folder. This is a bit of a pain to do-- is there a fix or other recommendation that I could try to use the Sync function as it was designed to do? Sorry for the late response! You can only save directly to the phone with Diving Log, when the phone is connected in mass storage mode (like a memory stick). Most phone nowadays connect via MTP mode and Diving Log cannot save directly to such a device. So the only workaround is saving to desktop and then copy the file in Windows Explorer. You can use the Google Drive app for now to upload and download the logbook file from Google Drive to the "Diving Log" folder on your Android device. In the Desktop version Google Drive sync is build in. Is it possible to sync with OneDrive with the new Android version, or are there plans to add that at some point? I try to add it, but it might be difficult due to the programming tools I'm using. When I checked the last time, there was no ready-to-use OneDrive SDK for these tools. 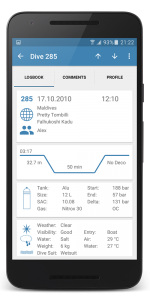 In the meantime you can use the OneDrive app to upload and download the logbook file from the "Diving Log" app folder to the "Divelog" folder in your OneDrive. If you want you can do this also in version 5.0, but you have to copy the file manually in Windows Explorer. You can use the "DiveMate" Android sync in 5.0 and then copy the *.sql file to the "Diving Log" folder on your Androi device. But you can update of course to 6.0, which has also other new features and improvements. You don't need a *.txt file, you need a *.sql file. You've probably selected the wrong Android app in the upper right corner of the sync dialog. You have to select the "DiveMate" app in the upper right corner or the SQLite export function from the export section. Or you can use the Dropbox sync function. Now have 6.0 om my PC could only get the first 10 dives to appaear on the phone, thought maybe i need to pay a fee for the up grade so paid it, will I now be sent a new code?